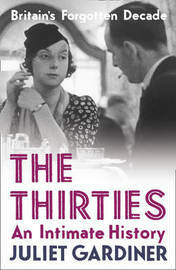 Acclaimed author of 'Wartime', Juliet Gardiner, brings to life the long-neglected decade of the twentieth century - the 1930s. J.B. Priestley famously described the 'three Englands' he saw in the 1930s: Old England, nineteenth-century industrial England and the new, post-war England. Thirties Britain was a land of contrasts, at once a nation rendered hopeless by the global Depression, unemployment and international tensions, yet also a place of complacent suburban home-owners with a Baby Austin in every garage.Now Juliet Gardiner, acclaimed author of the award-winning Wartime, provides a fresh perspective on that restless, uncertain, ambitious decade, bringing the complex experience of thirties Britain alive through newspapers, magazines, memoirs, letters and diaries.Gardiner captures the essence of a people part-mesmerised by 'modernism' in architecture, art and the proliferation of 'dream palaces', by the cult of fitness and fresh air, the obsession with speed, the growth and regimentation of leisure, the democratisation of the countryside, the celebration of elegance, glamour and sensation. Yet, at the same time, this was a nation imbued with a pervasive awareness of loss - of Britain's influence in the world, of accepted political, social and cultural signposts, and finally of peace itself. Juliet Gardiner is a respected commentator on British social history from the Victorian times through to the 1950s. She was editor of 'History Today' magazine and is also author of the critically accalimed and bestselling 'Wartime'.